Strictly speaking, casualty insurance is a type of coverage including liability protection only. 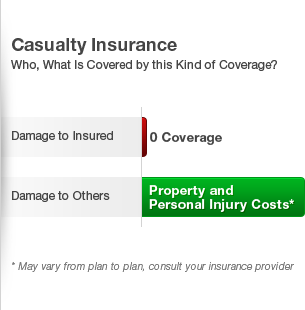 In other words, a casualty policy will only cover the damage to other persons or property for which you are responsible. In the purest sense, casualty insurance is distinct from home, health, and property insurance, though the lines have blurred somewhat in recent years. For agent and broker licensing purposes, for instance, most states conflate property and casualty insurance. Applied to car insurance, a casualty auto insurance policy typically describes liability-only coverage without any personal-property or other protection. Read on to understand more about how casualty insurance differs from other forms of coverage. The term "casualty insurance" can describe any policy that possesses only a liability component with no additional protection. The most common form of the coverage is casualty auto insurance, which covers only the damage and injuries the policyholder causes others. Such coverage protects the insured from financial losses relating to his/her negligence. Policies that include coverages like comprehensive, rental, personal injury, and so forth do not meet the strict definition of casualty auto insurance. The definition of casualty insurance can also vary by state law. For example, some states subsume coverages like worker's compensation, general liability, and glass insurance under the umbrella of casualty coverage. Fidelity and surety insurance as well as maritime insurance are often also classified as casualty insurance policies. As you'll see in the next section, these classifications are critical for agent licensing and other credentialing. To sell insurance in most states, an agent or broker must carry a license. Generally, these licenses are specific to a certain kind of insurance. In most states, however, the Department of Insurance lumps property and casualty insurance into one category for which only one license is necessary. To qualify, prospective licensing candidates must typically complete a certain number of classroom hours and achieve a passing score on a licensing exam. Licenses for the issuance of health insurance and life insurance policies usually have separate requirements. Also known as a liability-only policy, casualty auto insurance coverage is usually purchased by those who only carry a policy to comply with state law or by those who cannot afford more elaborate coverage. A casualty car insurance policy may be the best choice if your vehicle is not worth much and thus does not necessitate comprehensive coverage that would pay for damage it sustains in a covered loss. For most drivers, however, carrying a strict casualty insurance policy is simply not worth the substantial financial risk if an accident occurs.